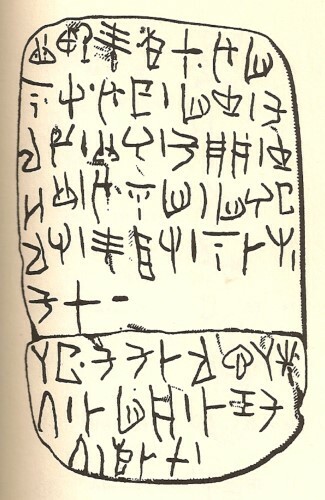 LinA is often characterized by its many accounting lists, as evidenced in Haghia Triada (HT) texts, such as HT 13. However, HT 117 is not an accounting list of commodities but rather a trade itinerary for the Minoan fleet. The heading suggests that it was written after the return journey. The words in the alphabetic list are linked to parallel entries in the lexicon, whereas the same words in the decipherment are linked to parallel entries in Toponyms. While bracketed place names are unattested in the Japanese dictionary, they represent my understanding through extensive research. This translation is a work in progress. .1 ma.ka.ri.te * ki.ro * u.mi. .2 .na.si , u.su , mi.tu , ku. .3 .ra.mu , ma.ru , ku.pa3.nu , tu. .4 .ju.ma , u.di.mi , mi.ru.ta. .7 sa.ta * ku.ku.da.ra , ko.sa.[i]. .8 .ti , da.mi.nu , da.ne.ku. .1 qif.tu.ne * ku.re.ju , di.ki. Annotation: As in HT 13, the first line on side α is not followed by a number and may be treated as a heading. Fascinating work by Gretchen Leonhardt.